How to Be a Grown-Up: Emma and Nicola Have Done It Again! While my vanity was flattered (that night cream is working?! ), I had no idea how to answer him. I mean, of course I’m an adult—otherwise I’d so still be getting those Conehead sundaes at Friendly’s—but I’m always faced with that alarming feeling of looking around for the grown-ups for the answers and realizing, shoot. I am one. That feeling is pretty much the crux of the fantastic new Emma McLaughlin and Nicola Kraus novel, How to Be a Grown-Up, which is one of the many reasons I loved it so gosh darned much. How to Be a Grown-Up tells the story of Rory McGovern, a forty-one-year-old mom of two who is married to her former teen heartthrob of a crush, Blake. Ahem. Thank you for that. When Blake’s acting career faces a roadblock, he dives into a pre-midlife crisis, deciding to “take a break” from parenting and marriage. With two expensive kids and an MIA spouse, Rory takes a job at a startup company run by two twenty-somethings fresh out of B-school—one who seems allergic to anything with sleeves, one who is constantly fighting off some kind of bug. Between trying to salvage her marriage, trying to keep her kids in one piece, and trying to understand the indecipherable language of her new pretentious company, Rory’s life becomes a complete juggling act—reminding us all that even though grown-up-ing doesn’t come with an instruction manual, even though we usually have no clue what we’re doing, sometimes, when we least expect it, we discover that we’re not doing such a bad job of it after all. Emma and Nicola capture everything that is confusing, complicated, impossible and yet kind of wonderful about adulthood. 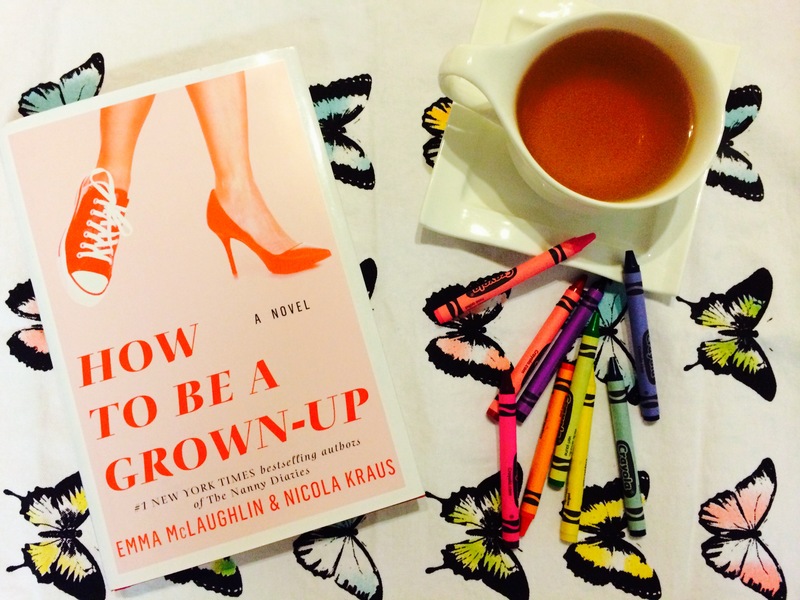 If you’ve ever felt that way, or if you’re just in the mood to hang out with some really great characters, I highly recommend How to Be a Grown-Up. Just be prepared to ignore your grown-up responsibilities for however long it takes you to read the book, because you will not be able to put this fantastic novel down. For more on these two fantastic authors, visit emmaandnicola.com and follow them on Facebook and Twitter! While you’re there, why not pop over to Book Perfume’s Facebook and Twitter? I’d love to hear what you’re reading! Sounds like a fun read! I have it in my TBR. I think you’ll really enjoy it, Melissa!!! And oh, Joey Joe…he was definitely my backup NKOTB boyfriend!